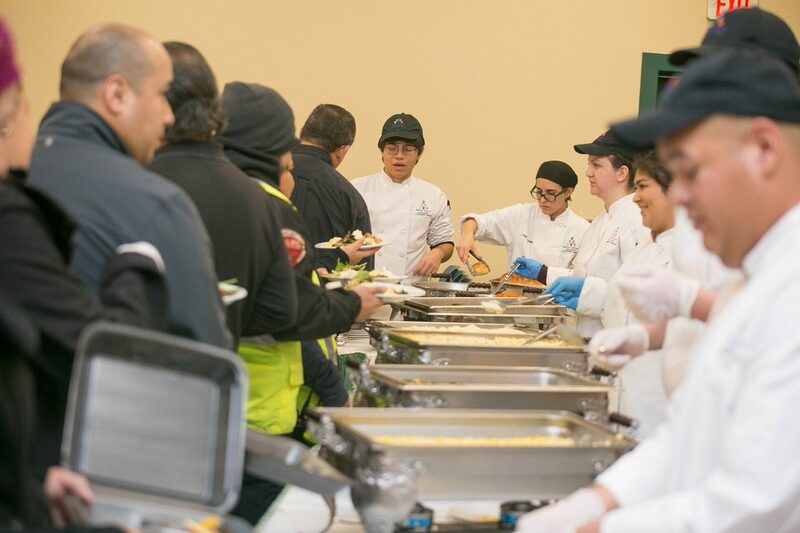 Courtesy photo South Texas College culinary students prepared and served Thanksgiving meals at a buffet line on campus to benefit the college's food pantry, which celebrated its first anniversary recently. Culinary students at South Texas College celebrated the first anniversary of a student food pantry at STC’s Pecan Campus. The food pantry provides meals for students and helps connect them to other supporting resources. At the Thanksgiving buffet, held Nov. 13, students served 350 faculty, staff and students, raising more than $2,284 to support the student food pantry and establish pantries on other STC campuses in the coming year. But according to Jennifer Guerra, chair of the Culinary Arts Department at STC, one of the biggest obstacles they face is making themselves visible on campus. The food pantry was established last year with the support of the Food Bank RGV, which initially agreed to provide all food for free, including transportation to STC’s pantry for a full year. That contract with the Food Bank is slated to end January 2019. The next step, according to coordinators of the pantry is to make it self-sustaining, and eventually open two more pantries at STC’s Mid Valley and Starr County campuses. The pantry offers rations of non-perishable food items, but the services to students extend beyond food donations. By connecting them with the appropriate counselors and staff at the college, students can potentially have access to a wide range of assistance. Those services can enable them to succeed while attending school, STC officials said. The student food pantry is located on the second floor in Building H at the Pecan campus. Students can contact any representative from Student Activities or a counselor to begin the process to request assistance. The process is anonymous. For more information, call Elibariki Nguma, director of Student Activities and Wellness at South Texas College, at (956) 872-2515, or email bariki@southtexascollege.edu.